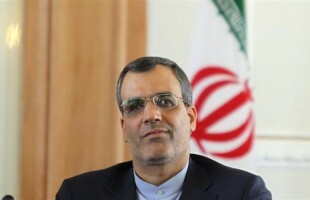 Iran’s Foreign Ministry spokesman [Hossein Jaberi Ansari, image left] has slammed as “unjust”, “ridiculous” and “absurd” a US court ruling against the Islamic Republic over the September 11, 2001 attacks in the United States. “The ruling is ludicrous and absurd to the point that it makes a mockery of the principle of justice while further tarnishes the US judiciary’s reputation,” he said. On Wednesday, Iran was ordered by a US judge to pay more than $10.5 billion in damages to families of people killed on 9/11 and to a group of insurers. US district judge George Daniels issued the judgment in New York, claiming Iran has failed to defend itself against allegations of involvement in the attacks. Saudi Arabia was legally cleared from paying damages to the families of 9/11 victims last year, after Judge Daniels dismissed accounts that the Persian Gulf monarchy provided material support to the terrorists and ruled that Riyadh had sovereign immunity. The spokesman further expressed regret that the US State Department in an “illogical, incorrect and immoral” approach has for years placed Iran on its so-called list of sponsors of terrorism. “This move has formed the basis for the dismissal of all principles of fair trials or even common sense in political ruling issued by certain US courts,” he said. “Although these unjust orders are apparently directed at the Iranian nation and government,” Jaberi Ansari said, ultimately it is the American people and families of the 9/11 victims whose rights will be violated as a result of these completely “misleading” court orders. The September 11, 2001 attacks were a series of strikes in the US, which killed nearly 3,000 people and caused about $10 billion worth of property and infrastructure damage. US officials assert that they were carried out by al-Qaeda terrorists but many experts have raised questions about the official account, saying it was a false-flag operation and that former al-Qaeda leader Osama bin Laden, also of Saudi origin, was just a bogeyman for the US military-industrial complex.